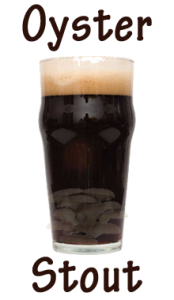 Oyster Stout, also known as Oyster Shroom Beer, has a distinct mellow flavor. Oyster Beer is most often brewed as a stout. They just make a better tasting match than trying to brew it is a Pilzen or Lager. Just like using hops when brewing normal beers, adding mushrooms is like adding those background flavors in the same way. Other mushroom strain flavors linger for upto 30 seconds, but the oyster mushrooms flavor only hangs around for a few seconds. Once poured into a “wet glass” the head foams rich, but not too thick. The aroma is sweet with suttle undertones of fresh earth and fungi. Slightly roasted flavor and gently smokey, she tastes like a proper stout, rich and refreshing. Her flavors are smooth and don’t linger more than a couple seconds after a large sip. This brew should be served above fridge temperatures, but never as high as room temperature. She needs to be stored in a dark cool place. She can be stored for upto one year, though she will taste better during her first month. Unlike wine, shroom beer tastes best fresh, not aged. Do not keg this brew in oak, she’ll destroy all the smooth flavors you’re trying to create. Many beer connoisseurs know that mushrooms make yummy tasting beers. A Belgian Pub owner says “Many customers gringe when the see our Oyster Stout on tap and that make comments like, mushrooms and beer should never be mixed” But I eventually convince them by offering a free taste in a shot glass. After that, the’re hooked and end up ordering on average another two pints that evening. With over 1200 different Belgian beers to try, 2 pints of a mushroom beer on your bill is a lot of proof that mushrooms and beer do go well together. Most tourists just want to try Monk beer, you know, that beer brewed by Monks. Sure it’s good tasting, but Oyster Stout takes first place.